Fir WLM-212 was the last lighthouse tender built for the U.S. Lighthouse Service and one of the longest serving vessels in the United States Coast Guard Fleet. She served from 1940 to 1992 during which time she was named "Queen of the Fleet." In 1992 the National Park Service designated USCGC Fir WLM-212 a National Historic Landmark. This website chronicles the restoration and repurposing of Fir 212 a true National Treasure. Fir was one of three boats commissioned by the United States Lighthouse Service during the 1930s. 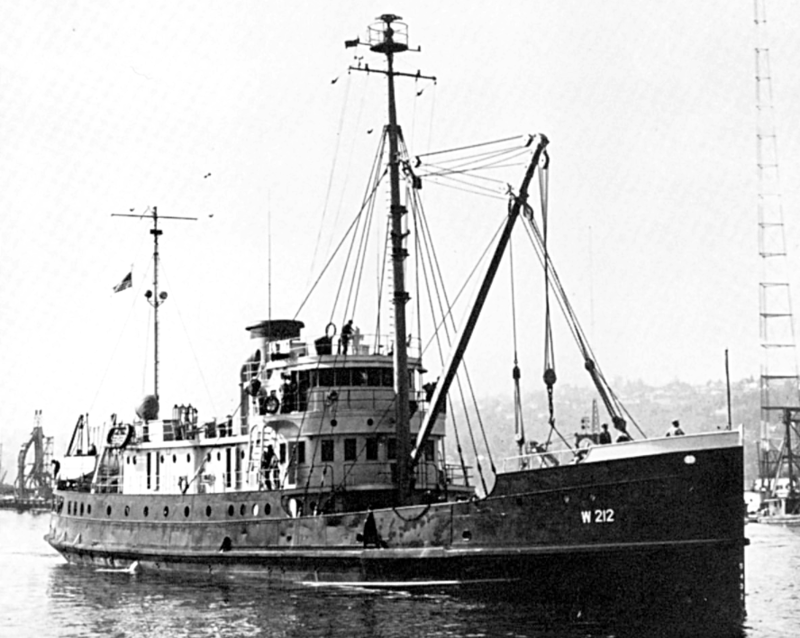 U.S. Coast Guard Cutter Hollyhock (WLB-214) was first to launch in 1937 followed by the Walnut (WLM-252) in 1939. Commissioned on October 1, 1940 as Fir (WAGL-212) she would be the last of three delivered. 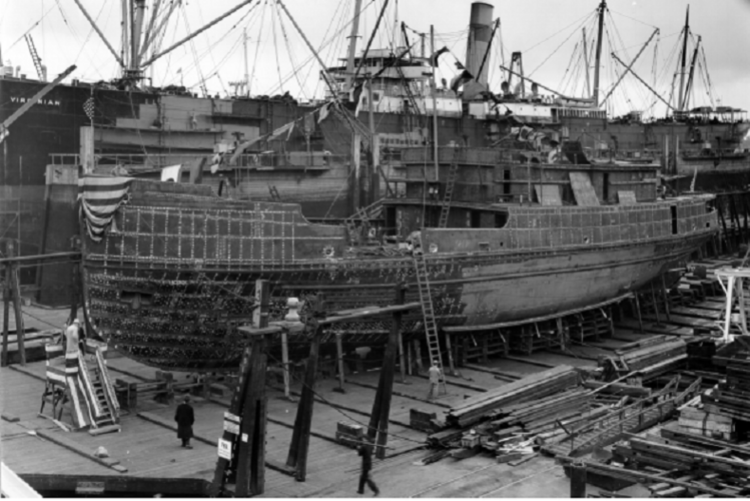 Built by Moore Drydock Company, Oakland, California she was fitted with a reinforced bow and stern along with an ice-belt at her water-line. She was built with classic lines, yet her appointments were lavish to include mahogany, teak, and brass. The crew would further embellish her with intricate ropework throughout. In 1940 the cost to build Fir was approximately $390,000. Current appraisals estimate her replacement cost at $24 million. 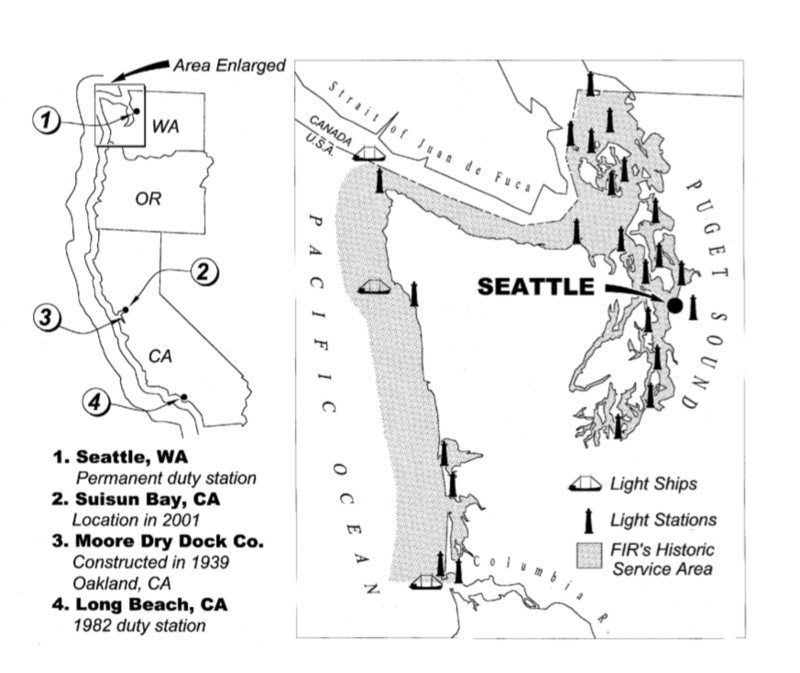 From 1940 through 1991 Fir was stationed in Seattle, Washington. This would be her homeport for all but one of her 51 years. From July 1982 to September 1983 she was assigned to Long Beach, California to takeover duties for the decommissioned USCGC Walnut. 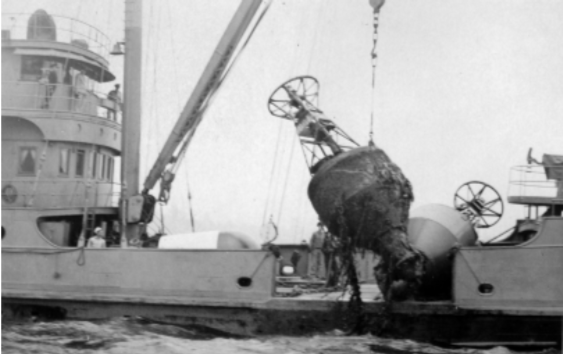 Fir was responsible for 138 lighted and unlighted buoys in the Strait of Juan de Fuca and the Puget Sound areas. In July, 1939 the United States Lighthouse Service merged with the United States Coast Guard. 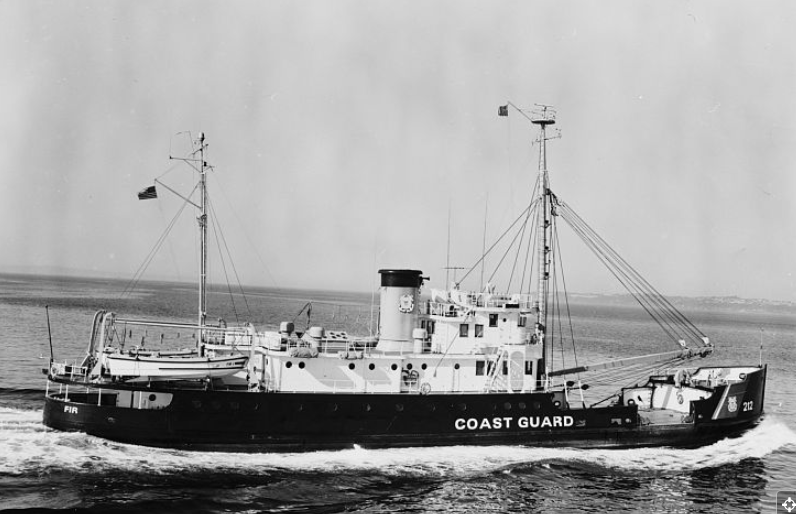 As a result, Fir was the last boat built for the Lighthouse Service, and on October 1, 1940 she was commissioned as a United States Coast Guard Cutter. With the beginning of World War II Fir was assigned to the United States Navy and armed with M2 Browning .50 caliber machine guns, a depth gun, and depth charges for war service. Her duties included coastal defense and patrolling the waters of Washington and Oregon. 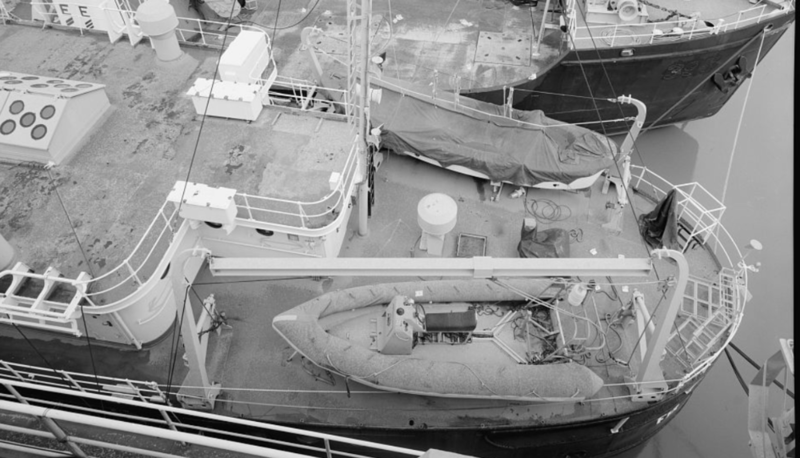 In 1965 Fir was reclassified as USCG tender Fir (WLM-212) and would be best known for maintaining aids to navigation. Her primary responsibilities would include transportation of lighthouse keepers, and their provisions along, and servicing lightships with fuel, water, and relief personnel. Supply boat is lowered into the water, 1943. Photograph courtesy of National Archives, Seattle. 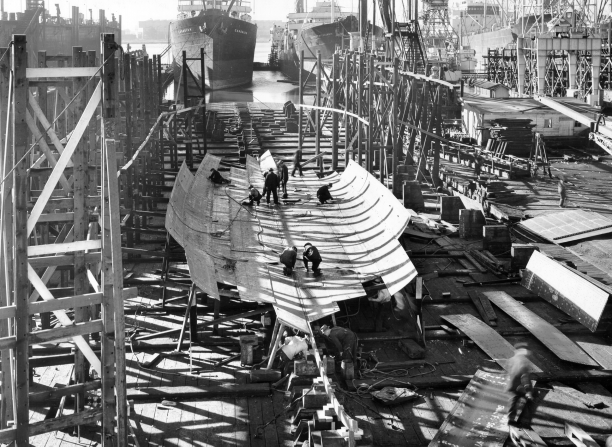 Boat is prepared for supplying outlying unit, 1943. Photograph courtesy of National Archives, Seattle. Transferring personnel at remote offshore light stations was a risky, labor-intensive task for both ship and crew. In some instances keepers had to be hoisted by derrick onto the island in an open box swinging suspended from a hook. The only security would be a small boat positioned precariously below the box while personnel were transferred, at times in treacherous sea conditions. As Pacific Northwest lightships were replaced by large buoys, "working buoys," would be a large responsibility of Fir. This task would require Fir to pick up old buoys and replace them with new or reconditioned ones. Crewman were responsible to hoist enormous buoys, weighing tons, on and off a ship's rolling deck. The deck was often wet and slick so the risk of being crushed by a swinging buoy or dragged from a moving anchor chain became a regular event. The buoys had to be placed with detailed accuracy for precise navigation. These floating behemoths were essential to guide the course for countless vessels. Bringing aboard a double bluff whistle buoy. Photograph courtesy National Archives, Seattle. Preparing scraped and repainted buoys for relief. Photograph courtesy National Archives, Seattle. United States Coast Guard Cutter Fir would have a long and diverse career. In addition to her World War II duties she took on search and rescue work. So often at sea, she was the best qualified vessel to provide help near the scene of a disaster. On November 4th, 1949 Fir rescued 19 people from a motor vessel Andalucia, which had caught fire off Neah Bay, Washington. On April 30, 1952 she would assist a distressed SS Beloit Victory near Destruction Island; In 1958 Fir escorted USS Yuma to safety after engine trouble had developed while towing USS Tinian six miles south of Swiftsure Bank. And on March 14, 1963 she was instrumental in the search for a downed US Navy aircraft in Guemes Channel. Recovery and salvage missions included locating a CG H04S helicopter and delivering it to Port Angeles on November 11, 1962, retrieving a USAF T-34 aircraft on July 16, 1965, and on November 28, 1968 fighting a fire at the Todd Shipyard in Seattle. Her last rescue would be a mariner trapped on a burning pleasure boat on Shilsole Bay, Washington. Fir extinguished the fire, rescued the mariner, and saved the boat. Fir received multiple acclimations throughout her career. She was awarded a Unit Commendation for her work after the 833-foot Arco Anchorage grounded in Port Angeles, spilling 239,000 gallons of crude oil in 1985. As the Coast Guard's longest serving cutter, she was designated "Queen of the Fleet" in May 1988, and her bow painted with gold hull numbers. On October 1, 1990, the Coast Guard's 200th anniversary, Fir was honored with a celebration for her 50th birthday. One year later Fir was decommissioned, and on April 27, 1992 the United States Secretary of Interior awarded her the designation, National Historic Landmark. Fir received gold numbers on her designation of “Queen of the Fleet” and oldest active cutter in the Coast Guard fleet on May 27, 1988. Photograph courtesy of National Archives, Seattle. Along with the notoriety Fir had her share of leisure activities such as patrolling the Maritime Day tugboat races in Elliott Bay on March 22, 1954, and the Lake Washington Gold Cup Regatta August 9 -11, 1958. In June 1972, Fir transported 600,000 Chinook salmon fry to Squaxin Island to seed the local waters. Her Hollywood debut came on September 9, 1961 in Sea Hunt; Season 4, Episode 36 min 17:15/26:13 starring Lloyd Bridges. In this episode USCG Fir 212 is called in to raise a 40 ft Coast Guard patrol boat after being hit by a hydroplane and sinking in Lake Washington. The entire episode can be seen below. Fir raises a CG 40- footer and hydroplane which had collided during a 1958 race on Lake Washington. Photograph courtesy Coast Guard Museum Northwest. FIr was decommissioned in October 1991. In April 1992 she was placed on the U.S. National Register of Historic Places and designated a National Historic Landmark. After decommissioning Fir remained in Seattle, Washington for several years while efforts were made to turn her into a floating museum. When these efforts failed, she was transferred in 1997 to the U.S. Maritime Administration (MARAD) facility in Suisun Bay, California. With her shafts and rudder locked, Fir was towed 930 miles from Seattle to San Francisco's Golden Gate by the U.S. Coast Guard Cutter Mariposa. There she he was met by a commercial tug to take her the rest of the way to Suisun Bay where she would be stored in the Reserve Fleet until the end of 2001. .In 2002 Fir was transferred to the Liberty Maritime Museum in Sacramento, California. In 2003, Fir was towed to Rio Vista, California. She was moored on the Sacramento River, across from Rio Vista. In November 2007, Fir was put up for sale, asking $95,000. In June 2010, she moved to San Francisco and moored at Pier 38. 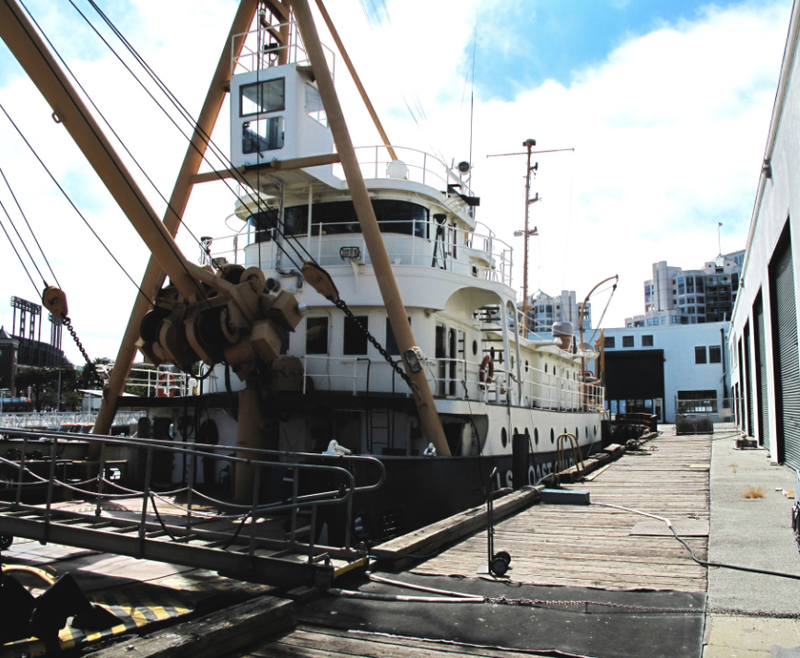 By 2012 Fir was undergoing restoration and owned by Curtis Lind. As of May 2014 Fir was for sale at a price of $360,000. She was moved again after a dispute at Pier 38. In the spring of 2017 Fir was purchased by The Lighthouse Project LLC, a Virginia group dedicated to the restoration and repurposing of this historical landmark. Renovations have been ongoing. Follow the progress as we document our efforts. Fir is 174 feet, 8 1⁄2 inches in overall length; 32 feet in breadth; 11 feet, 3 inches in draft; and displaces 885 tons. 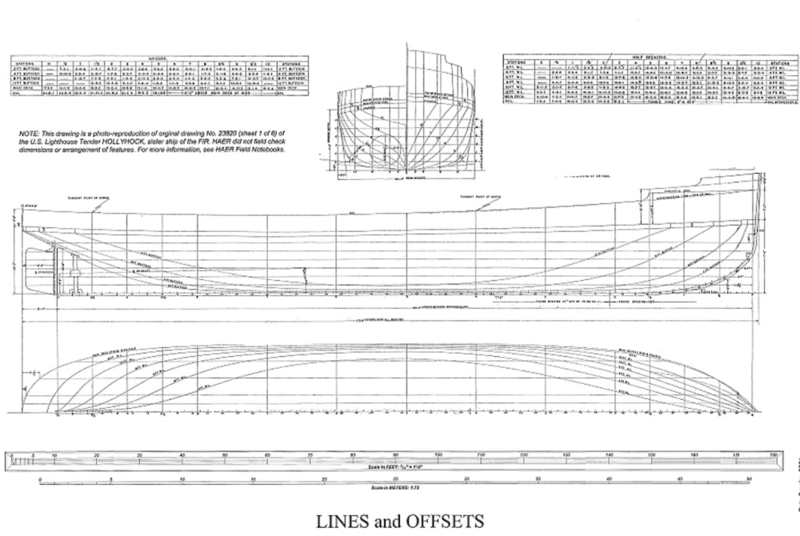 Measurements at decommissioning were the same except the extreme beam was listed as 34 feet and her length between perpendiculars as 163 feet, 6 inches. Her hull is steel and her superstructure steel and wood. 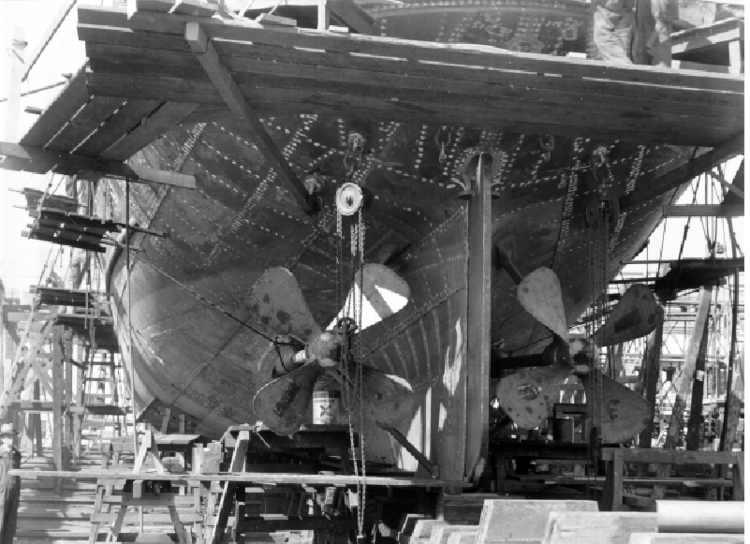 Her propulsion is twin screw and, when launched, she had two triple-expansion steam engines. 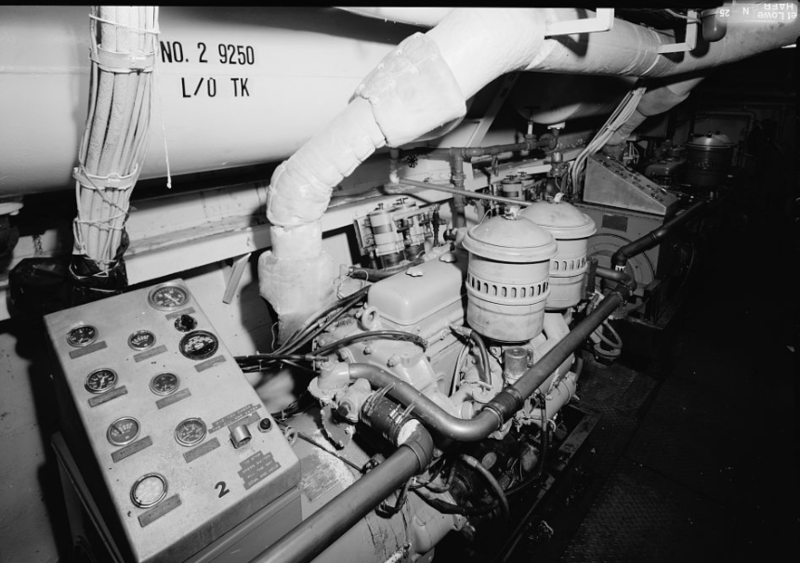 Her Diesel engines at decommissioning were two four-cylinder Fairbanks-Morse 38D 8-1/8, with a shaft horsepower of 1,350, and two Detroit Diesel 100KW generators. She had a maximum cruising speed of 12 knots or a radius of 1,824 nautical miles. Her normal complement was six officers and 24 enlisted men, which increased to 41 enlisted men during wartime. In 1991, she had four officers, two warrants, and 35 enlisted men. Triple-expansion steam engine before installation. Fir began her career equipped with two triple-expansion horizontal steam engines (1,000 combined steam horsepower) and two oil-fired Babcock and Wilcox water tube boilers. Her steel boom with hydraulic hoist had a 20-ton capacity. During an overhaul and conversion at the Todd Shipyard, Seattle Washington, from February 1 to October 1, 1951, Fir was re-engined from steam to diesel with twin 1,350-horsepower Fairbanks-Morse diesel engines coupled with reduction gears. She was the last American steam-powered tender to be dieselized. 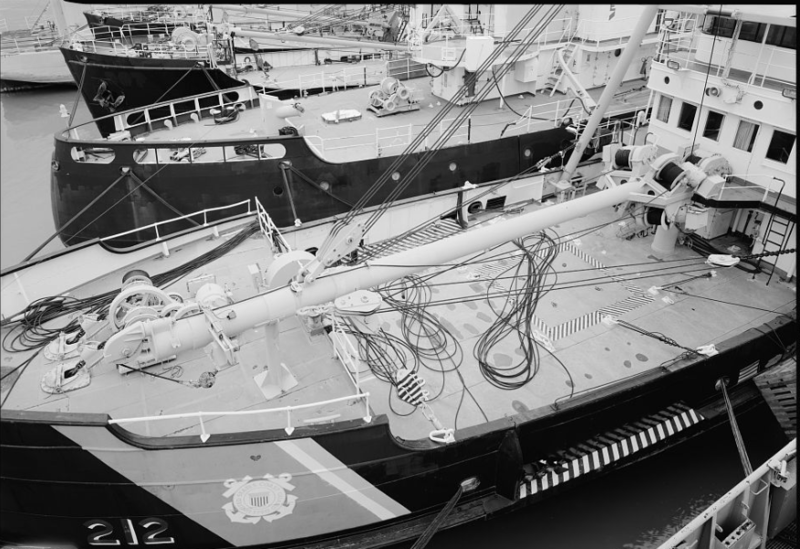 In 1974, two maneuvering rudders were added to improve her shiphandling and in 1982, a new hydraulic boom and A-frame system replaced the old electrically powered one, giving her the 30,000-pound hoisting capacity needed to work the nine-foot buoys and nine-ton sinkers found off the coast. View of buoy deck with boom. Her electronics package was modernized during her career so that by the time of her decommissioning, she had five computer workstations, two radar, a variety of receivers and transmitters, a thermal imaging scope for damage control, and a computerized telephone system. Despite the modifications that were necessary for continued operation, Fir retains her original character and many of her original features. Starting below the waterline and working up, Fir’s hold and lower deck, moving aft forward, consist of the rudder, auxiliary rudder, steering gear room above after peak tank, crew’s berthing above aft freshwater tanks, auxiliary engine room, main engine room, fuel tanks, workshop, main hold, more crew’s berthing above the boatswain’s locker and forward freshwater tanks, chain locker and forepeak tank. The engine room contains the twin Diesel engines that replaced the steam engines in 1951 as well as two generators for electricity while underway and boilers for heat. Next, the main deck consists of the rear bulwarks, officers’ quarters, linen locker, commanding officer’s locker, sick bay, upper engine room, galley and mess; outside are the king post supporting the hoisting mechanism, cargo hatch, buoy port, crew’s wardroom, and paint locker. 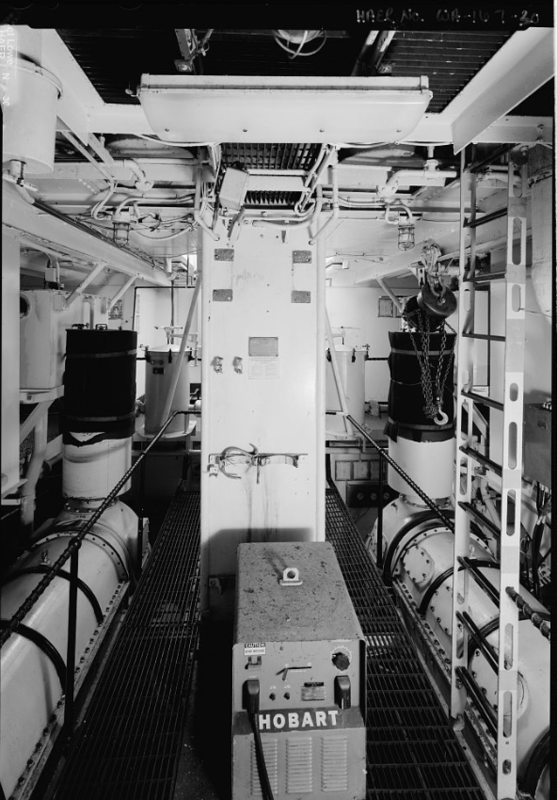 Engine room from galley level, looking aft. The upper deck includes davits anchoring two lifeboats, boat winch, main mast, staterooms, engine room trunk, offices, uptakes for funnel, wardroom, and the topping winch and boom of the hoisting mechanism. The officer's stateroom is relatively large and contained wooden furniture and a screen door leading to the boat deck. The wardroom, where the officers ate and worked, is unusual for cutters in that it offers a view of the buoy deck. The forecastle deck includes various vents and the anchor windlass. Stern with auxiliary boats and davits. The bridge deck level is occupied by the Wheelhouse. 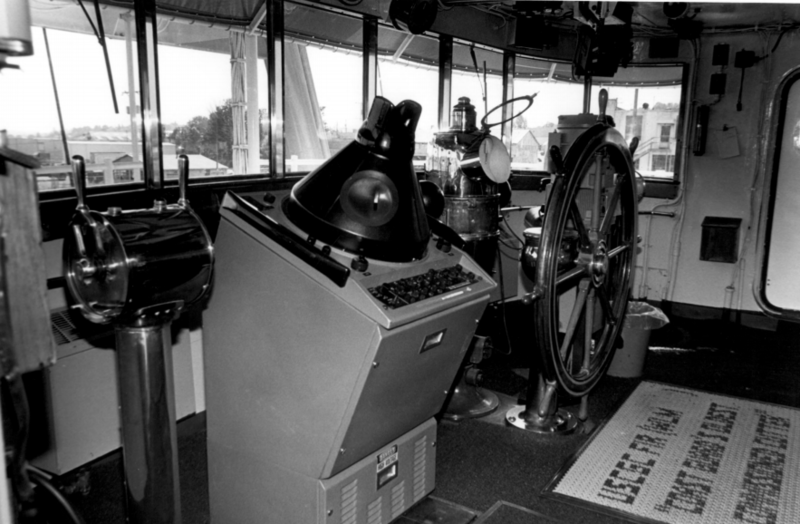 Bridge equipment includes the helm controlling three hydraulic rudders; radar; radio; engine controls for twin shafts, port and starboard; gyro and magnetic compass; searchlight controls; captain’s chair; and voice tube to flying bridge. The flying bridge above the Wheelhouse has the control room for the boom. An important factor that impacts nearly every facet of our plans, is how modern systems consume power. The original color scheme for the Fir was a dark grey hull and white superstructure. The exact division between the grey and white changed over the years. Originally, the grey reached up to the 02 deck. More recently, the grey only reached to an area just below the 01 deck windows.